Little fault can be found with a round of golf in lush tropical surroundings and ocean views. That is exactly what you can expect at Jamaica’s golf courses. The island has many high quality courses that are open for non-members or non-guests to play. You can stay close to Ocho Rios or venture to another area of the island for a relaxing and fun day out. Sandals resort in Ocho Rios is a beautiful 6,404-yard, par 71 golf course. As you navigate the course, you will enjoy fabulous sea and mountain views. The course is 18-holes, but you can play 9, and has three different tees, blue at 6,404 yards, red at 6,054 yards, and red at 4,961 yards. Non-members will have to pay green fees of $70 for 9-holes and $100 for 18. All players are required to use a caddy, which is charged at $17 per bag walking 18-holes and $12 for 9. For a shared cart the price is $25 per caddy for 18-holes and $17 for 9. You can hire a golf cart for $40 for 18-holes and $25 for 9, but they are not mandatory. You also don’t need to worry about bringing your own clubs, as the resort has club rentals for both right and left handed players. Clubs are charged at $60 for 18-holes and $35 for 9; balls are included. In addition to the course Sandals offers private golf lessons, putting greens, practice range, changing facilities, and an on course restaurant at the tenth hole. The Runaway Bay Golf Club is located at the Jewel Runaway Resort, about a 30-minute drive from Ocho Rios. The course is a par 72, 18-hole, 6,860 yard lush paradise. The course is suitable for both beginner and experienced golfers with both forward and back tees. Like Sandals it is mandatory to hire a caddie at a rate of $11 per person for 9-holes walking, and $16 for 18. For two people sharing a cart the cost is $15 for 9-holes and $20 for 18. Golf cart rental is $25 per round, regardless of if you play 9 or 18-holes. You can rent clubs for $40 per round. Green fees are $80 for non-resort guests. Facilities include a Clubhouse with outdoor eating, an excellent golf academy, lockers, and changing rooms. Rose Hall is a group of three resorts in the Montego Bay area. It is over 1.5 hours from Ocho Rios, so playing golf at one of these courses is definitely doable and worth the journey. The rolling fairways of the White Witch Golf Course are located on the Rose Hall Estate. The course is lush and has wonderful sea views. It is a 6,758-yard, par 71 course that gets its name from the infamous mistress of the plantation Anne Palmer, who was said to be wicked. 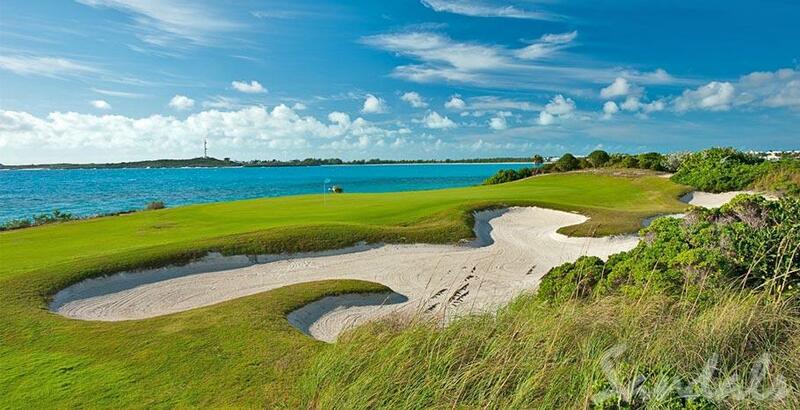 The course regularly ranks as one of the best in the Caribbean. Green fees range from $79 to $159 per person. To play this course you need to plan well in advance, as it is extremely popular. You will need to book your tee time at least 30-days in advance. Club rentals cost $55 for 18-holes and $30 for 9. Players are given two caddies for every group of four. Rose Hall’s Cinnamon Hill provides players with both a links course and inland course experience. The sea breeze swept course contains remnants of Jamaica’s past with graveyards and old buildings. The holes vary from open seaside fairways to the lower hills of the Blue Mountains. It is a par 72, 6,828-yard challenging course with four different tees making it suitable for a variety of skill levels. In addition to the course there is a driving range, putting green, and golf school. Green fees range from $79 to $169. Players also are provided with fantastic caddies that are always highly rated for their golfing skill. Half Moon Golf Course is the third Rose Hall course. Half Moon is a championship par 72, 7,141-yard course with five different tees. The course can be very challenging with tricky angles and strategically located bunkers the mix with its swaying palm trees. It is one of the pricier golf courses in Jamaica with green fees of $130 to $164 per person. Club rental is $50 and cart rental is $35. There is a teaching pro on hand as well as golf lessons, and practice facilities. Considering a visit to Jamaica? Contact us today for more information about, Jamaica Ocean View Villa, our 5-BR ocean view Jamaica villa rental experience in beautiful Ocho Rios , Jamaica. Perfect for families and groups.